When the public response to your marketing effort is, “WTF?” it generally means you’ve wasted your wad on some wannabe-Fellini creative director. But getting people to ponder is the point of The Franklin Institute of Science's rebranding effort. Agency Red Tettemer, Philadelphia, created the “Curious?”-tagged experiential program for the Philly museum to coincide with a logo change and shortened moniker (to The Franklin, or TF if you’re hasty). Artful elements around town and TV/print/Web media emphasize the mysterious mark as a playful, engaging driver for learning. The squiggly serves as the Waldo’s striped shirt of the campaign by popping up at such city sites as LOVE Park (home of Robert Indiana’s pop art “Love” sculpture) and Rittenhouse Square during the three-week stunt. 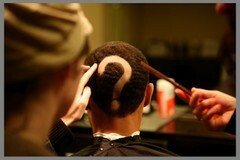 It's shaved into the head of an individual who roams public spaces by day and projected onto buildings at night. Activities are being filmed so they will get a second life online. Last Saturday, the question-coiffed man invaded Rittenhouse Square. A dog walker wearing a “Curious?” T-shirt and accompanied by a “?”-painted pup also strutted around the park, where the grass was tinted with the punctuation symbols. At other locations, stunty flash mobs formed to stare up at the sky and dispense “Curious?” postage-paid postcards to passersby. The scribbles and sketches that are solicited will be showcased at a microsite. Things got curiouser and curiouser on Sunday. Shaved head guy and the dog were back, and joining them in the park were large, question-mark-shaped grass mounds. So were hidden, motion-activated switches that prompted voices to whisper “Curious?” to visitors who tripped them. "Shaking blobs" emblazoned with “Curious?” also inhabited the habitat. On Thursday, a posse of painters will set up their easels in Rittenhouse Square and paint black question marks on their canvases. Everything is intended to drive curious consumers to www.curioustf.org and, duh, the museum. To Live and Diebold in L.A., N.Y. Still can't shake that hanging-chad envy? HBO Films is dragging a dozen of those Florida voting booths that starred in the 2000 president election to L.A. and N.Y. There, the people can punch the chad out of butterfly ballots to see if the low-tech system would have voided their votes. The one-day event--on a Tuesday (5/20), natch--promotes "Recount," the HBO film that recounts the state's controversial role in the Bush vs. Gore race that was ultimately decided by the Supreme Court. People who visit Recount Polling Stations in Union Square (N.Y.) and The Grove (L.A.) can cast their votes Fla.-style on a 2000 ballot using an authentic Florida Votomatic (It slices! It dices!) booth and ballot box, and will get a set of "Recount" trading cards featuring the cast (Kevin Spacey, Laura Dern, Denis Leary) for doing their civic duty. (On that note, Civic Entertainment Group, N.Y., is the agency.) The film premieres on HBO on May 25.